GULFPORT/BILOXI, MS (WLOX) - It was a sea of “Make America Great Again” signs and hats Monday night in the Mississippi Coast Coliseum as thousands gathered to hear President Donald Trump speak. With imitation snow falling inside the building, the president made his way through the Christmas decorations on display, entering the coliseum to the loud chants and cheers of his supporters. President Trump was in Mississippi campaigning for Republican Cindy Hyde-Smith, who is vying for a state senatorial seat against Democrat Mike Espy. With the midterm runoff on Tuesday, Nov. 27, the president arrived in South Mississippi to drum up support for Hyde-Smith. After being introduced by Vice President Mike Pence, President Trump took the stage, thanking several state leaders, including Gov. Phil Bryant and Lt. Gov. Tate Reeves. The president then brought out Hyde-Smith, who talked about representing the conservative values of Mississippi including lower taxes, less regulation, supporting the military, supporting veterans, supporting law enforcement, protecting the lives of the unborn, and supporting the Second Amendment. Hyde-Smith spoke briefly before turning the microphone back over to President Trump, who went on to talk for nearly 50 minutes about a number of things, including the recent pushback at the border against migrants. “We are sending a simple message to the lawless caravans and to the illegal trespassers marching toward our borders,” he said. “It’s very simple. Turn back now. We aren’t going to let you in. Turn back now." The president also discussed healthcare, world trade, job manufacturing, American steel, prescription drug costs, and poverty in the African-American communities. Before President Trump arrived on stage, crowds cheered and danced, eagerly anticipating his arrival. Crowds were also entertained by a man dressed as Santa Claus, who threw memorabilia to the crowd while “Don’t Stop Believing” by Journey played in the background. Before Santa, participants heard from several Republican state officials including Mississippi Sen. Joel Carter. Arriving on separate planes, President Trump and Vice President Pence flew in to Air National Guard Base in Gulfport about 20 minutes apart Monday evening. 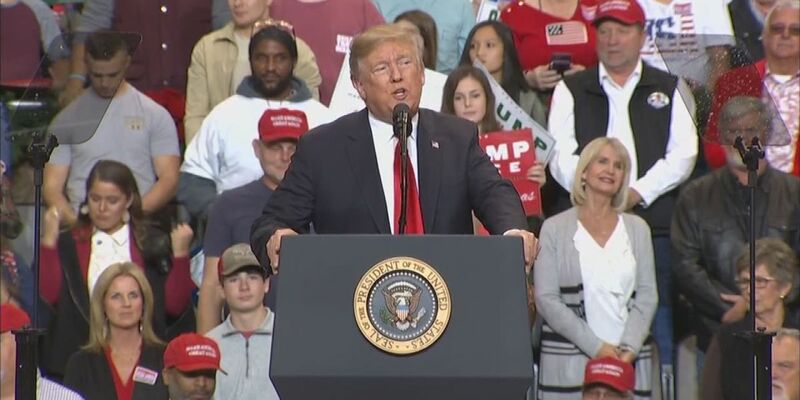 The president came down directly from Tupelo, where he held another rally in support of Hyde-Smith. Stepping off Air Force One, the president was surrounded by Hyde-Smith, as well as Mississippi Gov. Phil Bryant and other dignitaries. Trump, Pence, and the dignitaries gathered on base shortly after arriving to discuss prison reform around the country. The president said he wanted input from Mississippi officials because the Magnolia State has made major strides in reforming its prisons. This was the first time a sitting president and vice president both visited the Gulf Coast since the early 90s when President George Bush and Vice President Dan Quayle were welcome to South Mississippi. Pamela Moses formally announced her intentions to seek the mayor's seat this November. In West Memphis, four teenagers stood up and demanded change Thursday. After one North Memphis police precinct responded to four homicides in 36 hours, leaders in the area called for continued and increased focus on the youth.Memphis Mayor Jim Strickland agrees.